Indonesian President Joko Widodo updates media Tuesday on the crash of AirAsia Flight 8501. In his run for president this year, Joko Widodo pledged greater openness and accountability in Indonesia. As his administration faces its first international crisis, the mysterious crash of an AirAsia jet, he’s proving to be a man of his word. You can tell a lot about a nation from its response to great tragedy, whether it’s Japan’s 2011 Fukushima crisis, Malaysia’s lost Boeing 777 in March or South Korea’s deadly ferry accident in April. Mr. Widodo has performed admirably. Since news broke Sunday that an Airbus A320 flying from Indonesia to Singapore had vanished with 162 people on board, Mr. Widodo has coordinated rescue efforts, demanded a review of air-safety regulations and called for timelier weather information. His government is giving steady updates, and Mr. Widodo has sought help from neighboring countries as well as China and the United States. In contrast, last spring, Malaysia was widely criticized for the secrecy and paranoia that surrounded its search for a Malaysia Airlines flight that disappeared with 239 people aboard. Welcoming U.S. and Chinese military ships into Indonesia’s orbit speaks to Mr. Widodo’s confidence. Mr. Widodo is the fifth president since dictator Suharto was ousted in 1998 but the first political outsider to run Southeast Asia’s biggest economy. Because he’s not a member of a dynastic family or the military, he isn’t beholden to vested interests looking to siphon the benefits of Indonesia’s 5 percent growth. That gives him latitude to dismantle the kleptocracy that Suharto built. 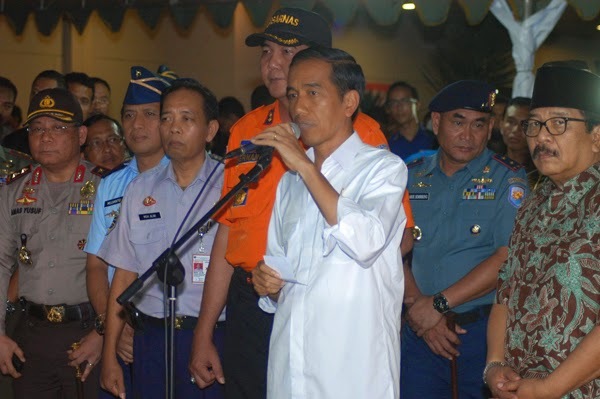 As governor of Jakarta, Mr. Widodo brought a surprising level of transparency. He moved budget-procurement and tax-collection processes online. He’s now working to make national government services electronic to reduce opportunities for graft and improve efficiency. Opening the process of granting licenses for infrastructure, mines and plantations alone would do much to clean up the political and business climate. Indonesia’s aviation industry also has long cried out for greater oversight. It’s notorious for its regulatory laxity, a product of cronyism and institutional neglect. The daylight Mr. Widodo wants to shine on the government is needed to ensure that scarce revenues are spent on education, health care and poverty programs. The way Mr. Widodo has responded to Flight QZ8501 gives reason to hope that Indonesia will be prepared for whatever comes its way. William Pesek is a columnist for Bloomberg View.